This delicious, airy, and sugary treat is one for the books! It is a testament to “good things come to those who wait.” Meringues, although actually quick to make, get their crispy outside and soft inside from low and slow baking. 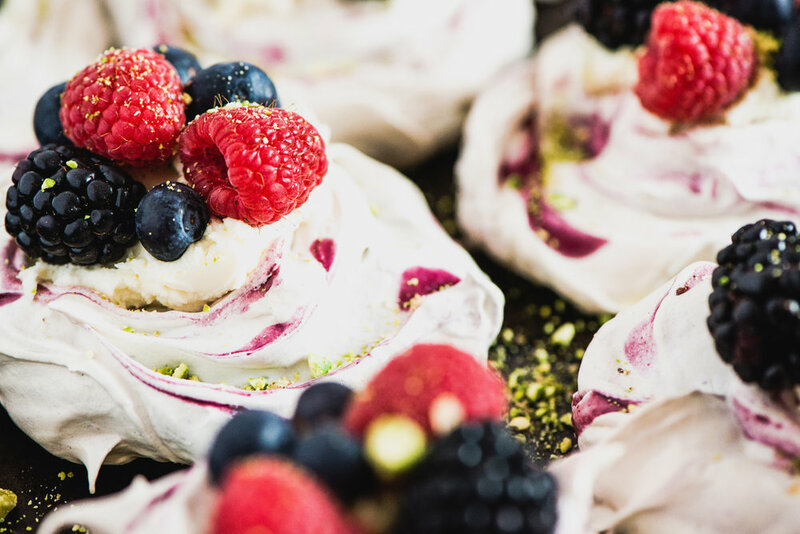 It’s believed that meringue was first developed by the Swiss, then perfected by the Italians, and then brought to France to claim glory in patisseries across the globe. Although the true history is not confirmed, one thing is for sure: these AMAZING little dollops of goodness will always have a place in my go-to baking repertoire. 1 cup plus 2T sugar. Place granulated sugar in a blender, grind until it is a fine powder. 1 cup plus 2T granulated sugar yields approximately 1 cup superfine or caster sugar. The benefit to using a caster sugar for this recipe is so that it dissolves more quickly in the double boiler without cooking the egg whites. 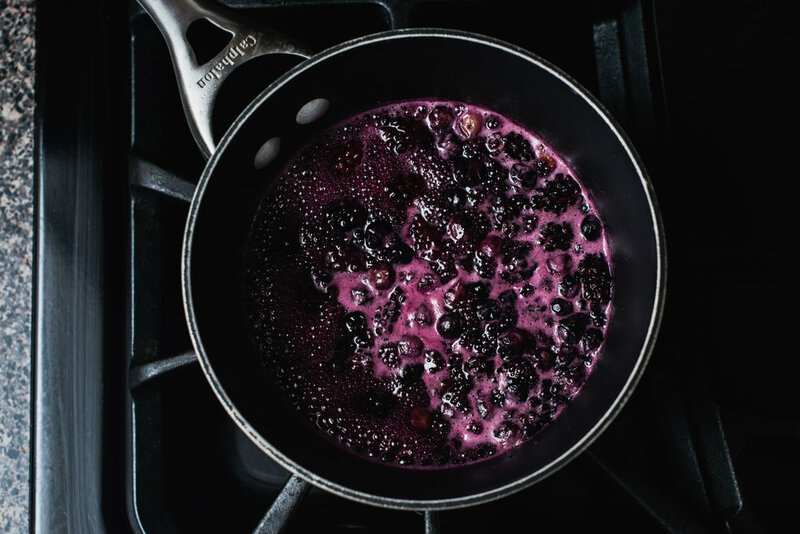 Mix the sugar, berries, and water together in a medium-sized sauce pan and simmer over low/medium heat for about 20-30 minutes, stirring occasionally. Stir more towards the end to avoid burning the berries. Remove from heat and remove seeds by straining into a glass jar or bowl. Allow the strained liquid to cool completely. Preheat the oven to 240 degrees Fahrenheit. Line 2 baking trays with either silpats or baking paper. Separate your egg yolks and whites. I usually suggest doing this one at a time into a measuring cup or small bowl to ensure that the yolks don’t accidentally break and ruin the whole bunch. Next prepare a double boiler. A double boiler allows you to gently heat or melt ingredients without cooking them. To do this you’ll need to fill a small or medium sized sauce pan 1/2 to 1/3 full with water. Bring to a boil, then reduce to a simmer. Take a large stainless steel bowl and place your egg whites and sugar in it. Place the bowl over the simmering water, making sure that the bowl’s bottom doesn’t touch the water. The goal here is to gently dissolve the sugar without actually cooking the egg whites. Continuously stir the mixture until the sugar has dissolved. The mixture should be warm to the touch, but not hot. Next, transfer your egg white mixture to a mixer or use a hand mixer to beat until stiff peaks form. You’ll know it’s ready when the mixture is shiny and glossy. If you take a spoon and dip it in the mixture, it should form a peak when you pull it out. Take two tablespoons of the berry syrup and gently fold it into your whipped meringue mixture. Make sure not to over-mix (you want to see gentle ribbons of berry syrup in your meringue). Next, using two large spoons, place plum-sized dollops of your meringues onto your prepared baking sheet. These should be placed at least a full inch apart. Once you have your mounds of meringue, take a spoon or palate knife and create a divot or nest in the center of each meringue. This is where your awesome toppings will sit. Next, take some more of your berry syrup and drizzle it over the tops of your meringues. With a toothpick or back end of a spoon, swirl the syrup gently into the dollops to create your swirling design. Place on the middle rack of your oven and bake for 1 hour. Once your hour is up, turn off the oven. Keeping the door closed, leave your meringues to sit overnight. If you need to remove them sooner, leave them for at least 2 hours with the oven door closed. Leave your mascarpone on the kitchen counter for about 20 minutes to come to a little cooler than room temperature. Place in a mixing bowl with a tablespoon of caster sugar and gently whip for about 15-20 seconds. Place tablespoon amounts of mascarpone into the nest of your meringue. Fill with mixed berries and crushed pistachios, and try to not eat them all before serving them to your guests. These are a super tasty treat that begs to be made over and over! My background of photography goes back to when I was a child. My first photography course at summer camp exposed me to a medium that spoke to me more than words, song, or paintings ever could. I was truly smitten. Since then, I have been fortunate enough to work amongst the most talented photographers, stylists, and art directors in the industry. It has been an experience that has shaped my photographic journey and taught me the true meaning of hard work and passionate pursuits. Now living in Baltimore, MD with my awesome husband and adorably rambunctious daughter, I'm starting a new chapter in Charm City continuing to work with businesses both small and large to tell the stories of their brand. I believe in small businesses and big ideas, bold flavors and subtle intentional design elements. I want to help your business flourish and become everything that you envisage. Visit my contact page and tell me a bit about yourself.